In memory of the dead of the Rainbow Division. AEF. 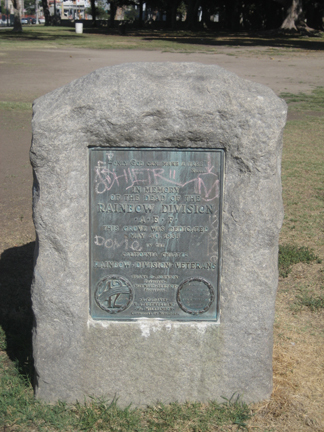 This grove was dedicated May 30, 1935 by the California Chapter Rainbow Division Veterans. Frank O. Johnson, President. Maynard Bledsoe, Secretary. A. C. Davis, K. A. Sutherland, Wm. Williamson, Committee on memorials. St. Mihiel, Meuse - Argonne, Champagne - Marne, Defensive Sector Aisne-Marne.